This nobleman, who had been committed to the Tower prior to the death of King Charles 11, was brought to trial in the reign of King James 11 for high treason, before the Lord Chancellor Jeffreys, constituted High Steward on the occasion, and a select number (27) of peers, but was most honourably acquitted. After which he lived in retirement until the revolution, when espousing the cause of the Prince of Orange, he was deputed with the Marquis of Halifax and the Earl of Shrewsbury upon the arrival of the Prince of Windsor, 17th October 1688, to bear a message to the fallen monarch requiring that His Majesty should move from Whitehall. An office which his lordship executed so delicately, that King James was afterwards heard to remark, " that the Lord Delamere, whom he had used ill, treated him with so much more regard that those to whom he had been kind, and from which he might better have expected it". His lordship was afterwards sworn of the Privy Council and appointed Chancellor of the Exchequer, an office which he held but one year. Upon his retirement he was advanced to the dignity of Earl of Warrington, by letters patent, dated 17th April 1690. His lordship who published a vindication of his friend Lord Russell, and other literary productions mentioned in Walpole's catalogue, died on the 2nd January 1693/4 and was succeeded by his second but eldest surviving son. Cresswell has compiled further tables on this noble and famous line of the family. 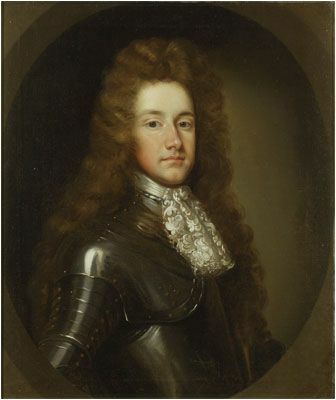 Lord Henry succeeded to the title of 3rd Baronet Booth, of Dunham Massey, co. Chester [E., 1611] on 8 August 1684. He succeeded to the title of 2nd Baron Delamer of Dunham Massey, co. Chester [E., 1661] on 8 August 1684. He was created 1st Earl of Warrington, co. Lancaster [England] on 19 April 1690.